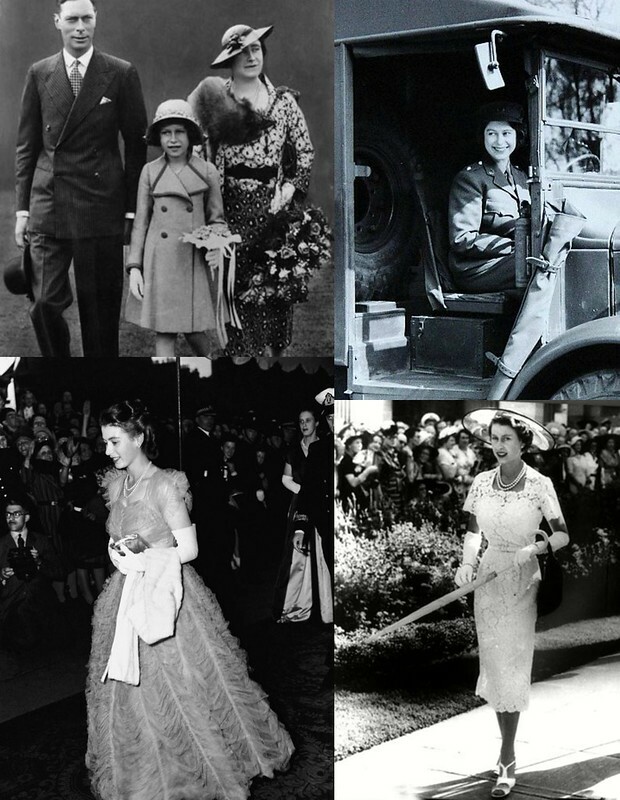 This post is all about her majesty Queen Elizabeth who is celebrating her official 88th birthday this summer (her real birthday is in April). We tend to think of the Queen as a old lady who wears pastels, big hats and doesn't smile a lot but Queen Elizabeth was a bit of a stunner in her day. She was classy and demure, as you would expect a queen to be, but rather chic and stylish too. With divine gowns a serious amount of bling to wear, she keep her make up minimal and her hair neatly coiffed. She's still chic and impeccably dressed now and here are some of my favourite looks that span more than eight decades. The Queen has seen the world change beyond all recognition during her reign and during the Second World War, in which she served in the Auxiliary Territorial Service. I love the photo of her in uniform, we aren;t used to seeing her dressed down unless she's walking in Balmoral. 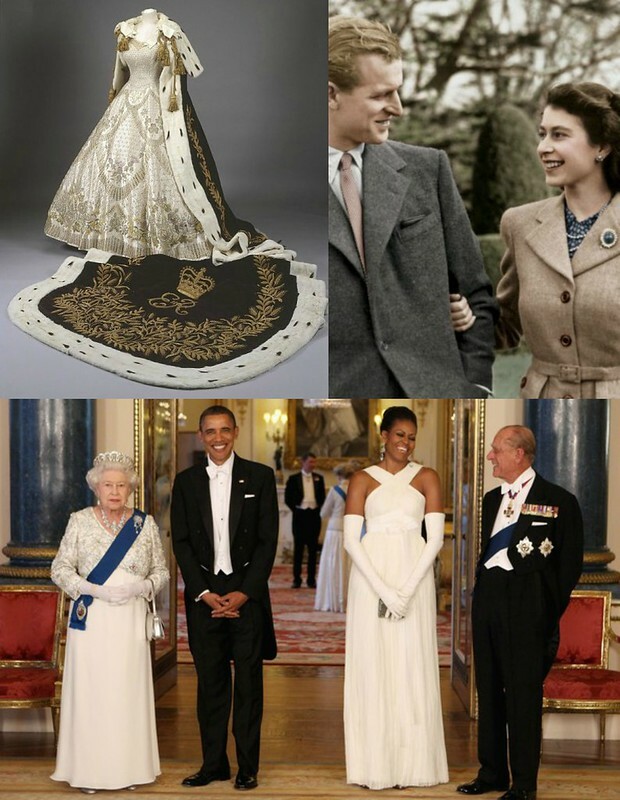 The white dress at the bottom right handside was worn in 1954 and is possibly the most glamorous outfit ever worn by HM, she was on tour in Australia. How tiny is that waist?! The Queen's coronation gown was truly impressive. She wanted the same silhouette as her wedding dress but with emblems of the United Kingdom and all her dominions included. It had to be a dress that wasn’t totally eclipsed by the fact its wearer was sporting a crown, an orb, and a scepter; and it had to outshine an abbey full of other royals. Here was the ultimate statement dress. A young, English rose was transformed into a monarch. The Queen has spent her whole life dressing for the public eye. Just as with the jewels, the dresses and the regalia had to be in keeping with her position, so they also had to be sensitive to time and place. They had to be practical, but also diplomatic. Never has a wardrobe had to work so hard. Her hems are weighed down so they don’t blow up; her skirts must be long enough to protect her dignity when sitting down; her fabrics mustn’t crease; her colors must stand out in a crowd; and her hats must show her face. During a broadcast to the British Commonwealth on her 21st birthday, she made the following pledge: "I declare before you all that my whole life, whether it be long or short, shall be devoted to your service and the service of our great imperial family to which we all belong." No matter what you think about monarchy, you have to hand it to her, the Queen has spend her life in service to her country and she does a rather good job of it.